Here are some snazzy birthday facts about 27th of July 1903 that no one tells you about. Don’t wait a minute longer and jump in using the content links below. Average read time of 9 minutes. Enjoy! What day was my birthday Jul 27, 1903? July 27, 1903 was a Monday and it was the 208th day of the year 1903. It was the 30th Monday of that year. The next time you can reuse your old 1903 calendar will be in 2026. Both calendars will be exactly the same! This is assuming you are not interested in the dates for Easter and other irregular holidays that are based on a lunisolar calendar. There are 99 days left before your next birthday. You will be 116 years old when that day comes. There have been 42,270 days from the day you were born up to today. If you’ve been sleeping 8 hours daily since birth, then you have slept a total of 14,090 days or 38.58 years. You spent 33% of your life sleeping. Since night and day always follow each other, there were precisely 1,431 full moons after you were born up to this day. How many of them did you see? The next full moon that you can see will be on April 19 at 11:14:00 GMT – Friday. Fun stat: Your first one billion seconds (1,000,000,000) happened sometime on April 4, 1935. If a dog named Baeley - a Cane Corso breed, was born on the same date as you then it will be 558 dog years old today. A dog’s first human year is equal to 15 dog years. Dogs age differently depending on breed and size. When you reach the age of 6 Baeley will be 45 dog years old. From that point forward a large-sized dog like Baeley will age 5-6 dog years for every human year. Friedrich Barbarossa arrives at Niš, the capital of Serbian King Stefan Nemanja, during the Third Crusade. The Jesuit priest Francis Xavier’s ship reaches Japan. A Royal charter is granted to the Bank of England. Kaiser Wilhelm II makes a speech comparing Germans to Huns; for years afterwards, “Hun” would be a disparaging name for Germans. The animated short A Wild Hare is released, introducing the character of Bugs Bunny. Japanese troops occupy French Indochina. Centennial Olympic Park bombing: In Atlanta, United States, a pipe bomb explodes at Centennial Olympic Park during the 1996 Summer Olympics. One woman (Alice Hawthorne) is killed, and a cameraman suffers a heart attack fleeing the scene. One hundred eleven are injured. What does my birthday July 27, 1903 mean? 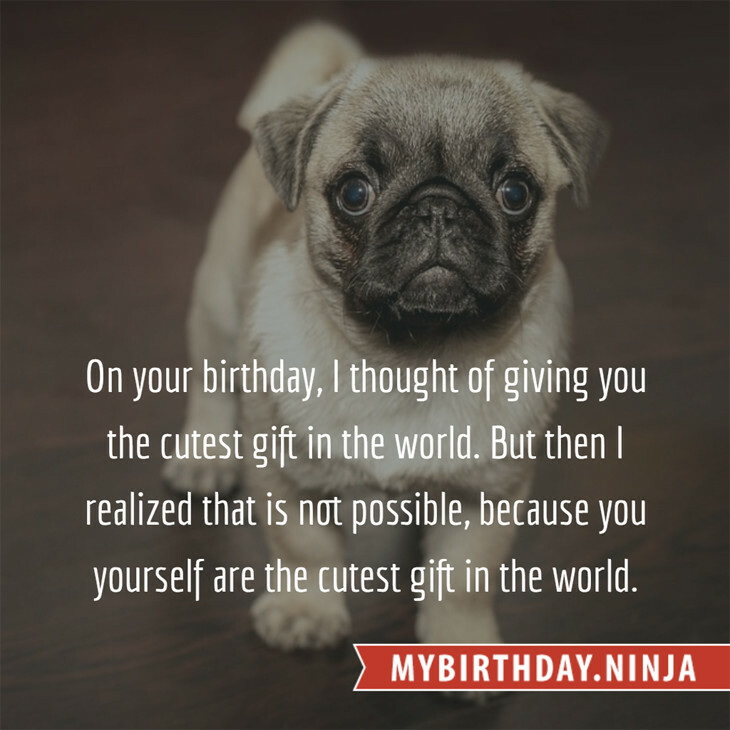 Your birthday numbers 7, 27, and 1903 reveal that your Life Path number is 2. It represents balance, harmony and partnership. You have the soul of an artist. You are a fine companion and possess a good sense of humor. Friends seek you out for your calming and peaceful company. The following celebrities also have the same life path number: Lauren Tom, Jeffrey Lee Pierce, George Baker, Mehrzad Marashi, Ellary Porterfield, Richard Lewis, Stephan Jenkins, Neetu Singh, Mariah Carey, Katherine Moennig. 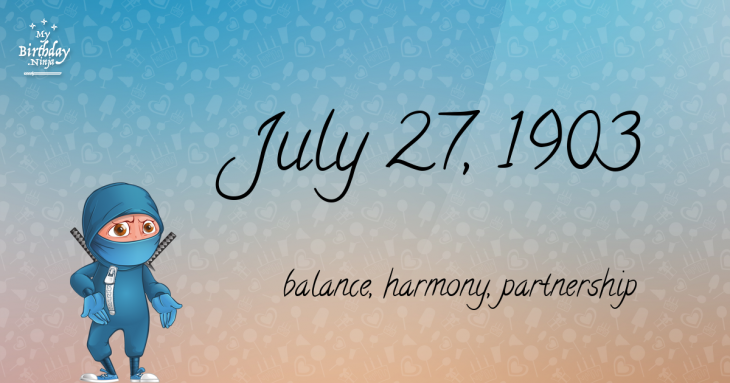 What is the birthday horoscope for Jul 27, 1903? The Western zodiac or sun sign of a person born on July 27 is Leo ♌ (The Lion) – a fixed sign with Fire as Western element. The ruling planet is Sun – the center of our universe. According to the ancient art of Chinese astrology (or Eastern zodiac), Rabbit is the mythical animal and Water is the Eastern element of a person born on July 27, 1903. Fun fact: The birth flower for 27th July 1903 is Larkspur for haughtiness. What is the Love Match for Jul 27, 1903? When it comes to love and relationship, you are most compatible with a person born on August 18, 1908. You have a Love Match compatibility score of +183. Imagine being in love with your soul mate. On the negative side, you are most incompatible with a person born on December 11, 1903. Your incompatibility score is -247. You’ll be like a cat and a dog on a love-hate relationship. Arf-arf, I want to bite you. Meow-meow, stay away from me! What is the popular baby name on 27 Jul 1903? Here’s a quick list of all the fun birthday facts about July 27, 1903. Celebrities, famous birthdays, historical events, and past life were excluded. Try another birth date of someone you know or try the birthday of these celebrities: September 16, 1965 – Katy Kurtzman, American actress and producer; October 15, 1972 – Matt Keeslar, American actor; December 24, 1941 – Mike Hazlewood, English singer-songwriter (The Family Dogg) (d. 2001).